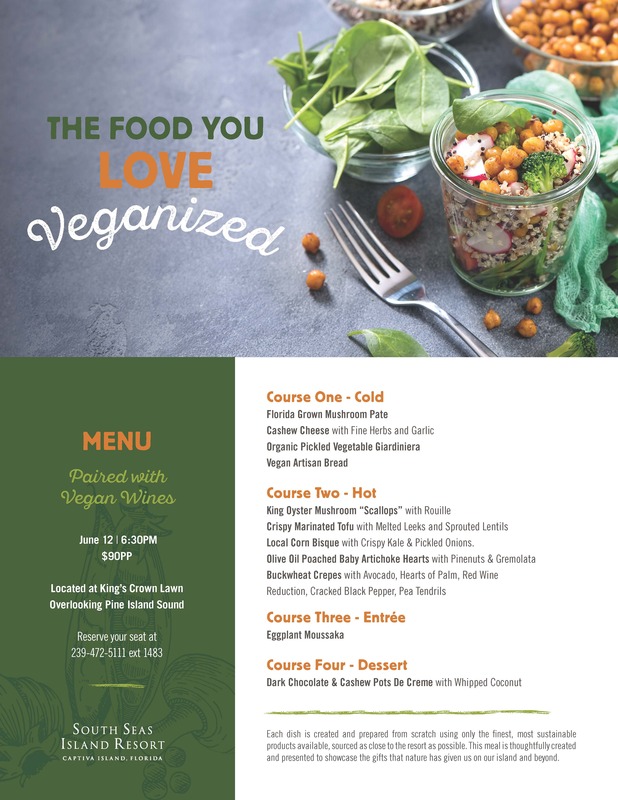 Beginning at 6:30PM, this four-course dinner will be paired with vegan wines and will be served in a picturesque setting overlooking Pine Island Sound. Menu items include Florida Grown Mushroom Pate; Local Corn Bisque served with crispy kale and pickled onions; Olive Oil Poached Baby Artichoke Hearts; Buckwheat Crepes served with avocado, hearts of palm, red wine reduction, cracked black pepper and tea tendrils; Eggplant Moussaka and Dark Chocolate and Cashew Pots de Creme served with whipped coconut. This dinner is priced at $90 per person and reservations are required. Reservations may be made via 239.472.5111 ext. 1483.